The One runs Android 4.4.2 KitKat with Sense 6.0 providing the user interface. HTC redesigned aspects of Sense while still providing the same feature set offered on last year's phone. 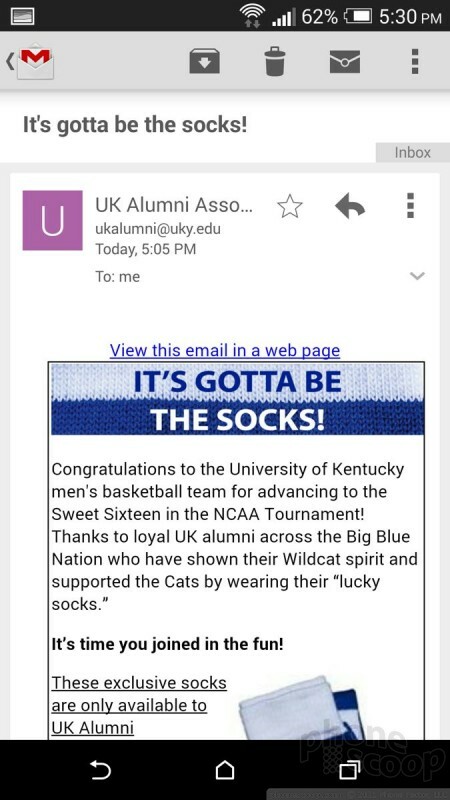 Frankly, Sense feels as heavy-handed to me as ever. The one thing it has going for it over Samsung's TouchWiz and LG's UI is that I actually like the fonts, icons, and other elements that make up the user interface. It has a more modern, angular look. Obviously that's a personal preference, and one which you might not share. Let's start at the beginning and work our way inward. The lock screen can be customized in many different ways. 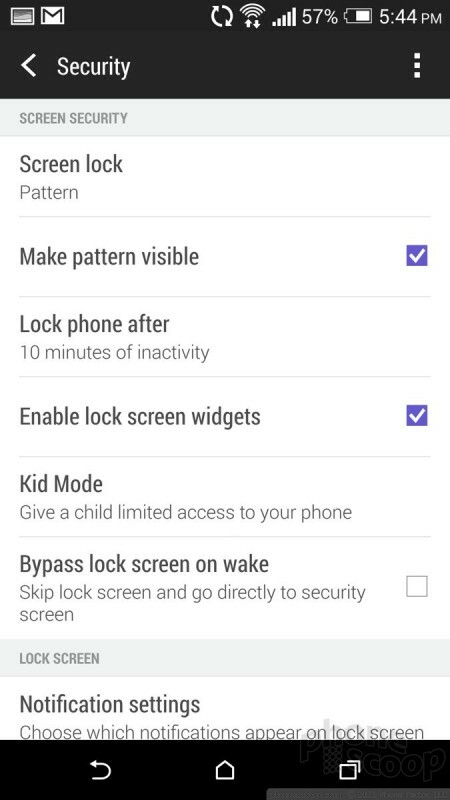 As always, users can choose to employ a screen lock or not. Possibilities include a pattern, PIN code, and traditional password. You can put up to four shortcuts at the bottom of the screen that can be opened directly from the lock screen. 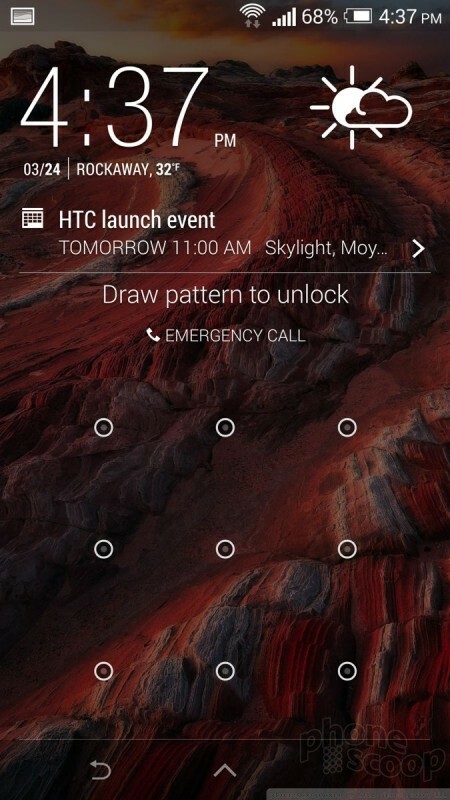 When a lock is used, only notifications and the camera can be opened from the lock screen. Everything else requires that the device be unlocked first. The lock screen can be given its own wallpaper, can be set to show notifications, can be set to include the time/weather, and can also be turned off entirely. As far as lock screens go, it offers a lot. One thing HTC added this year are gesture motions. These are gestures you can use to make the One perform certain actions even when it is locked. For example, pick the phone up and tap on the screen twice to turn on the clock. Tap twice again to turn it off. Similarly, you can swipe to the right to reveal Blinkfeed (more on that below,) or swipe to the left to reveal the home screen. I like the idea behind the gesture motions, but in reality I found they hardly ever worked correctly. The problem is they make the phone hyper-sensitive to being handled. For example, at one point I took the phone out of my pocket and put it on a table. In so doing, I accidentally unlocked it and launched Blinkfeed simply due to the way my fingers brushed the screen. If you hold the phone in your hand at all for any length of time, you're going to accidentally lock it, unlock it, turn it on, turn it off, and so on. In fact, I often found that I'd accidentally moved my home screen widgets around. In the end, I had to disable this feature, as it started to drive me crazy. The home screen panels behave somewhat differently compared to the old One. First, BlinkFeed is no longer the default home screen. Instead, it is one screen to the left. There are two additional home screen panels active out of the box, but you can add or subtract from the number of home screen panels whenever you so choose. I like that you can easily set the actual "Home" home screen panel (the one that appears when you press the home button.) 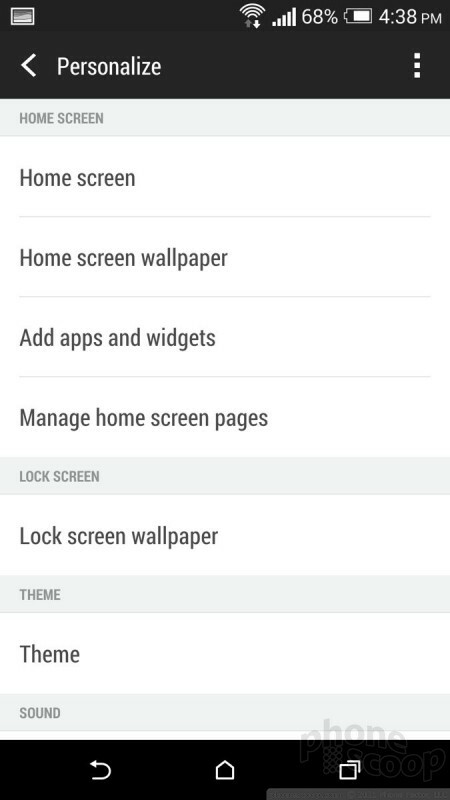 The home screen panels can play host to apps, folders, widgets, and all the normal items that go along with any Android home screen. There's a common dock at the bottom that holds four shortcuts plus access to the app menu. A word about the buttons. Last year's One had two hardware buttons: home and back. I hated that set-up. It drove me nuts. This year, HTC saw fit to ditch the hardware buttons entirely and now uses the standard set of three software buttons that come and go as needed. They are back, home, and multitask. I'm very happy to have the multitasking button back once again. HTC still uses its grid-style multitasking screen, rather than the vertical column used by most Android devices. HTC alsop redesigned a number of the system icons. Some might be unrecognizable and take getting used to. 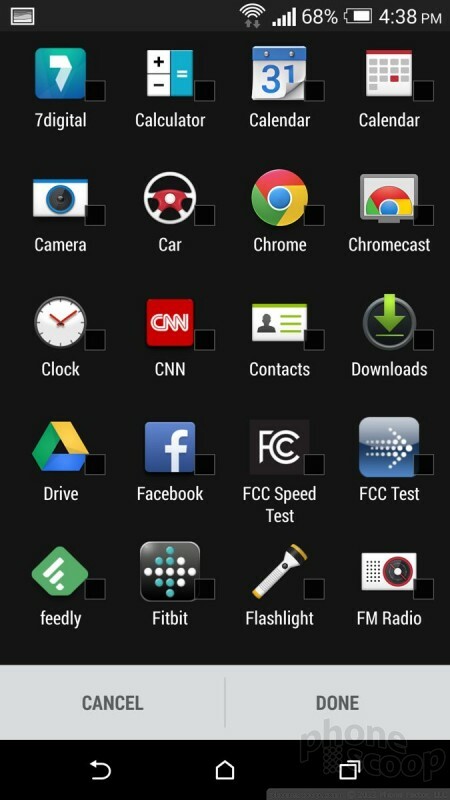 The app menu looks and functions exactly as it does on the 2013-era One, One max, and One mini. 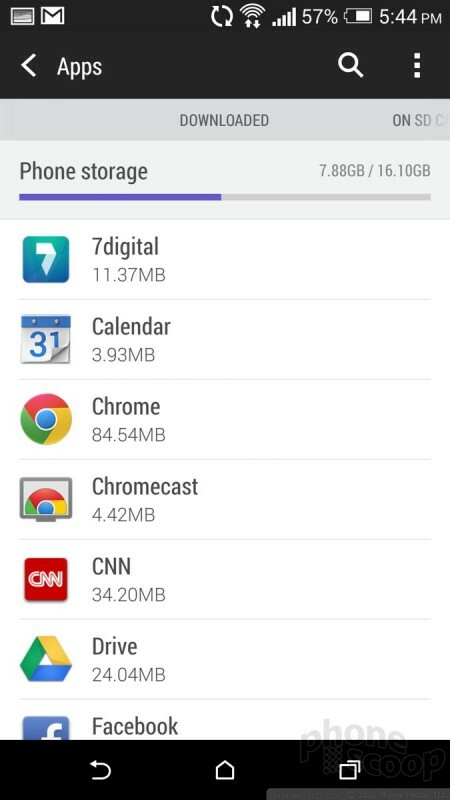 Apps can be arranged alphabetically, in a customized order, or by most recently used. The tool bar at the top of the page lets you search among your apps, as well as hide them, manage them, and change the size of the app grid. 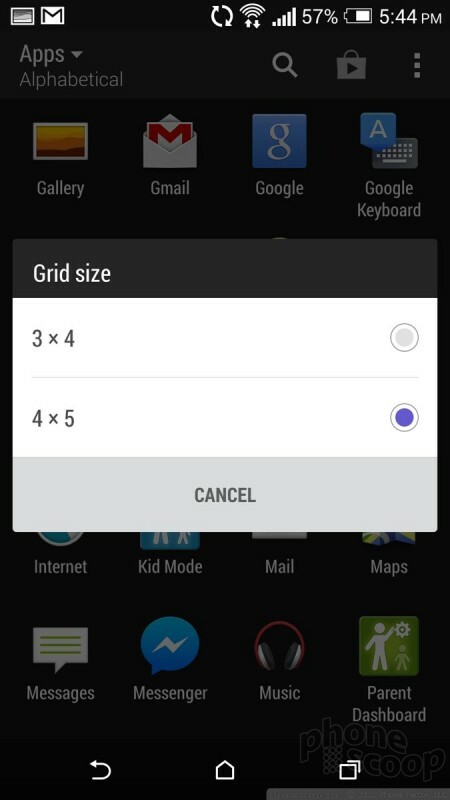 The default is a four by five app grid, but you can switch it to three by four if you want. 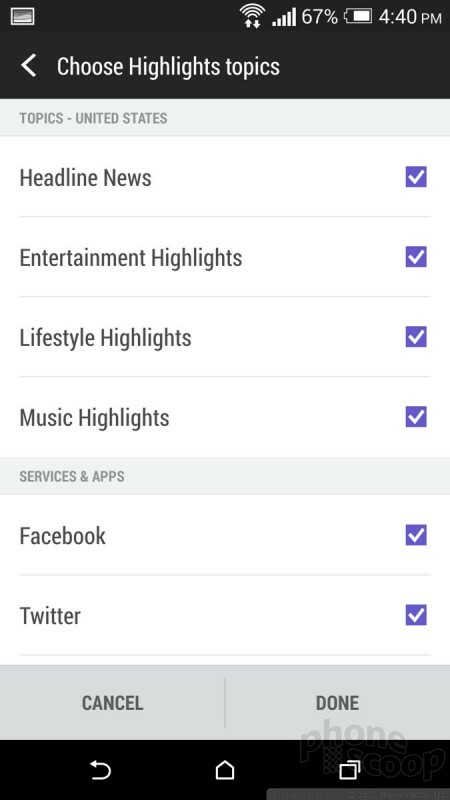 Last, there's a link that will take you directly to the app section of the Google Play Store. You can't view the app menu as a list, but you can use folders and a hide/unhide tool to help manage clutter. Using the settings menu to customize the One isn't too troublesome. Its basic layout is similar to that of other Android devices. All the wireless and network controls are bunched at the top, followed by the personalization tools, and hardware tools. Personalization tools run the norm. Users can of course select their own wallpapers, ringtones, and alerts. 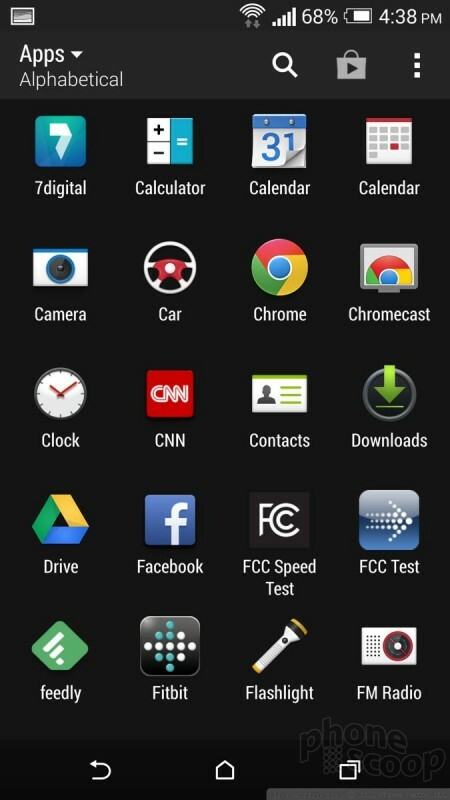 HTC has included several different themes, too. The themes offer different wallpapers and accent colors to go along with them. The differences are subtle, but enough that the personality of the phone feels sufficiently altered if you switch themes. 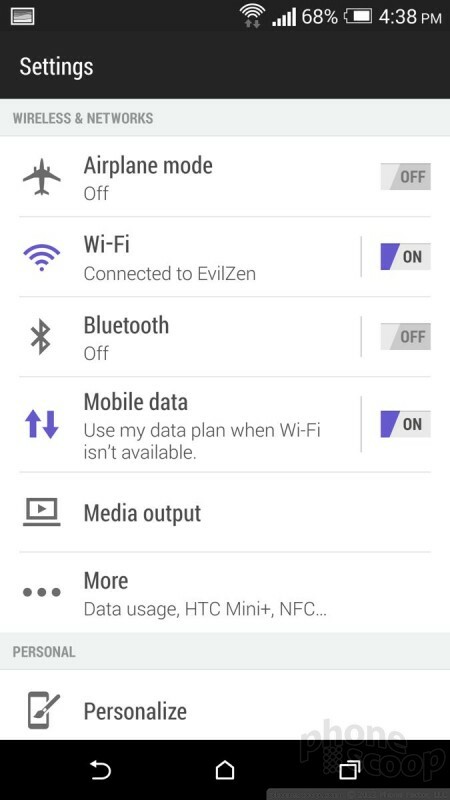 If you've used any device running Android 4.0 and later, you'll feel at home using the settings tools. The notification tray is one of the simpler features of the user interface. 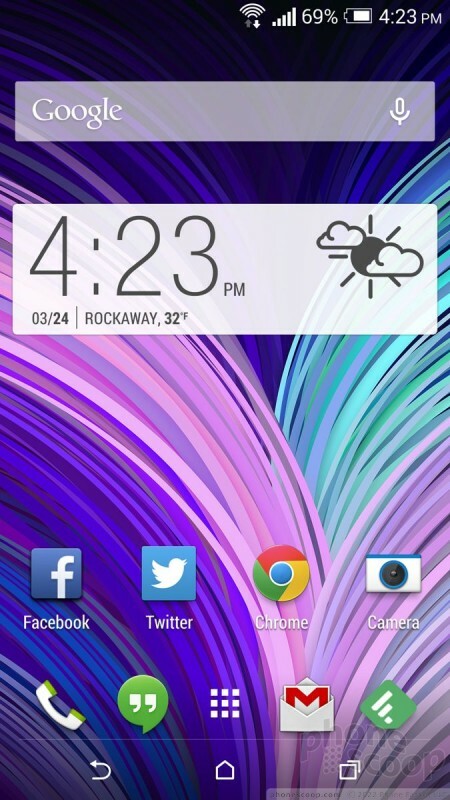 As with most Android devices, it has actionable notifications, as well as a shortcut to the radio toggles. 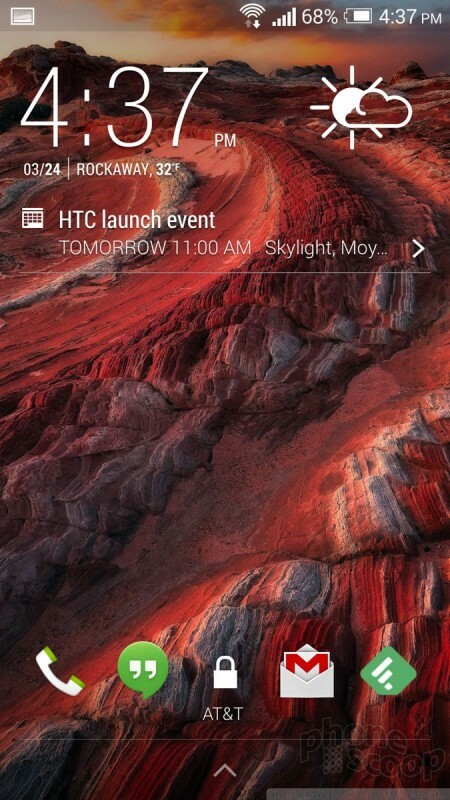 HTC doesn't put the toggles themselves directly into the notification tray, like Samsung and LG do. I don't mind the extra step to reach the toggles, as it leaves more room in the notification tray for, you know, notifications. The HTC One is powered by the Qualcomm Snapdragon 801 with four cores at 2.3GHz each and 2GB of RAM. The 801 can support clock speeds up to 2.5GHz, but HTC decided to go with a slightly slower clock speed in order to keep power use down. That's not a bad thing, not at all. I ran the HTC One head-to-head with the LG Nexus 5, which has a Qualcomm Snapdragon 800 with four cores at 2.3GHz each. The One spanked the hell out of the Nexus 5. To my eyes, the One did everything twice as fast. It opens apps instantly. It performed searches faster. Everything about the One feels insanely fast. I didn't run into any performance problems of any kind while testing the HTC One. It is a fast, fast, fast phone. 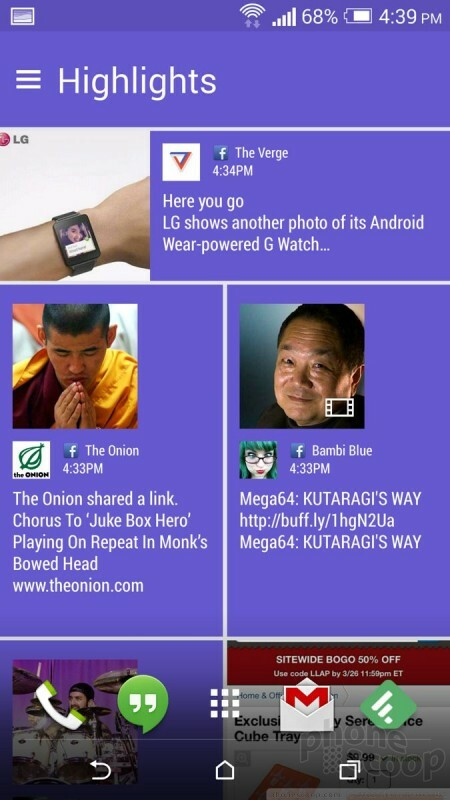 HTC has more or less rewritten BlinkFeed from the ground up. 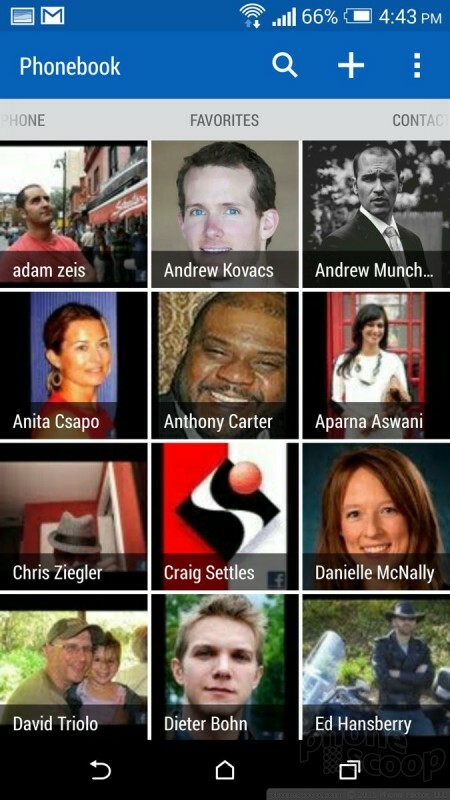 BlinkFeed is a social news reader akin to Flipboard. It can be used to cull content from the owner's Facebook, Twitter, and Instagram accounts, as well as sprinkle in content from just about any other site/feed you might wish. Some of the significant changes include the introduction of color. HTC has added nice, bright colors to BlinkFeed in order to liven it up a bit. Honestly, they help. Second, HTC got rid of the annoying page-by-page scroll action and replaced it with natural, continuous scrolling. These together go a long way toward making BlinkFeed more usable and more likable. Adding content is a bit different. Before, HTC offered a wide range of pre-loaded content sources from which to choose. The initial content options on the new One are fewer, but it has a much more powerful search tool. You can search for just about anything and instantly create a feed that pulls stories, images, and video from across the internet. For example, I performed a search for Captain America. BlinkFeed found several news sources, as well as captured all the Tweets it could find about Captain America and created a single news source for all things Captain America. What's cool is you can parse the initial results to pick and choose which sources you subscribe to or simply subscribe to them all. HTC told us that they wanted to make it easier for people to "snack on content" with BlinkFeed, and I think it achieved that goal. Personally, I still prefer the UI and tools offered by Flipboard, but BlinkFeed is a solid substitute - especially since it is presented in a format made specifically for the One. 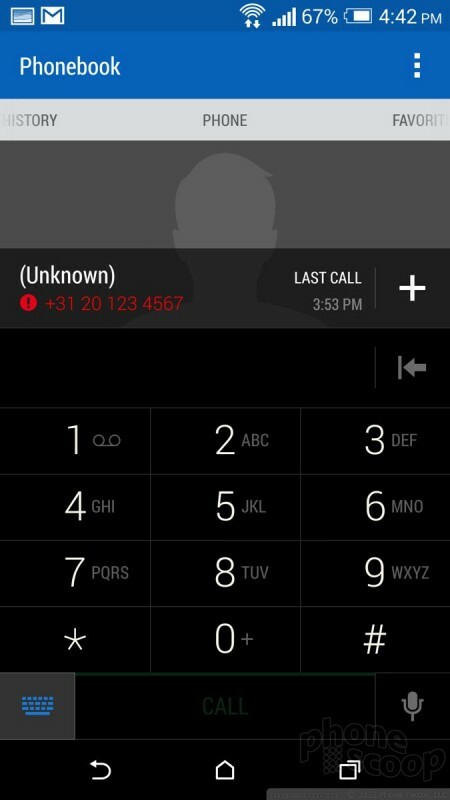 The One's calling and contact apps appear to be mostly carried over from last year's phone with only minor changes. 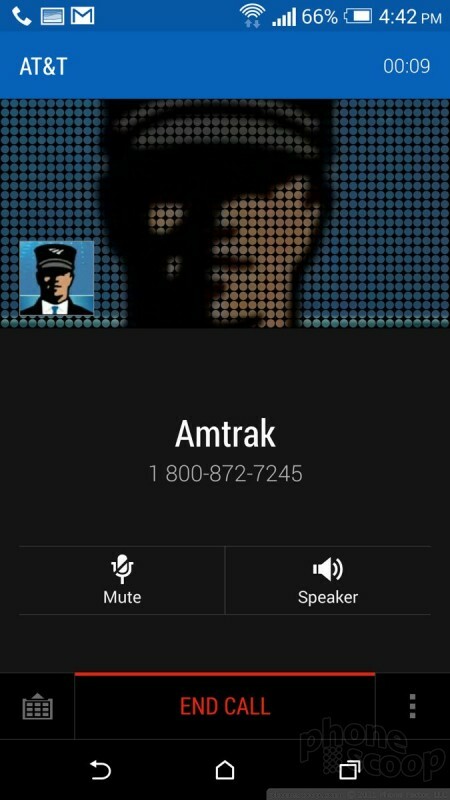 The phone app is straightforward to use. The default view is whichever section of the app you used last. 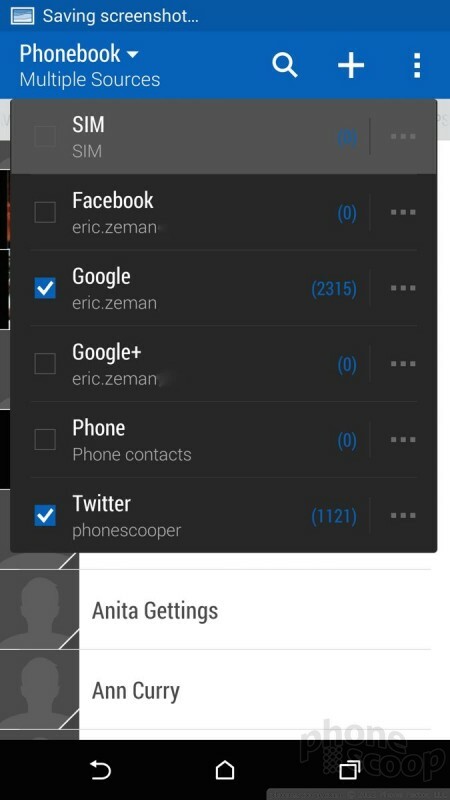 There are five tabs: call history, dial pad, favorites, contacts, groups. The tabs can be edited if you wish (you can rearrange them or substitute in several other options). The dial pad is easy to use, or you can switch it to show a keyboard so you can type the name of a contact rather than a number. In-call options run the norm, including adding a line, send to speaker/bluetooth, mute, and so on. You can also use voice commands ("Call Mom's cell") if your hands are otherwise occupied. I had good luck with the voice commands. 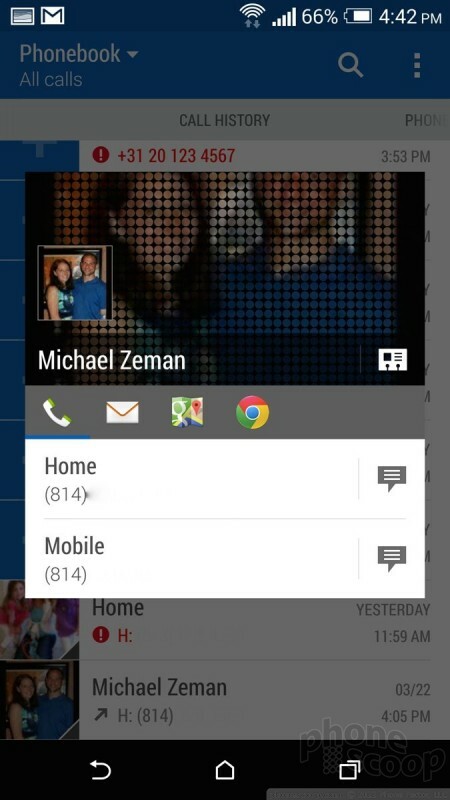 The contact app does a great job of pulling in social networking details, and lets you sort between your various contact sources (phone, SIM card, Facebook, Twitter, etc.) with a drop-down tab. (It doesn't interact with LinkedIn data, though.) 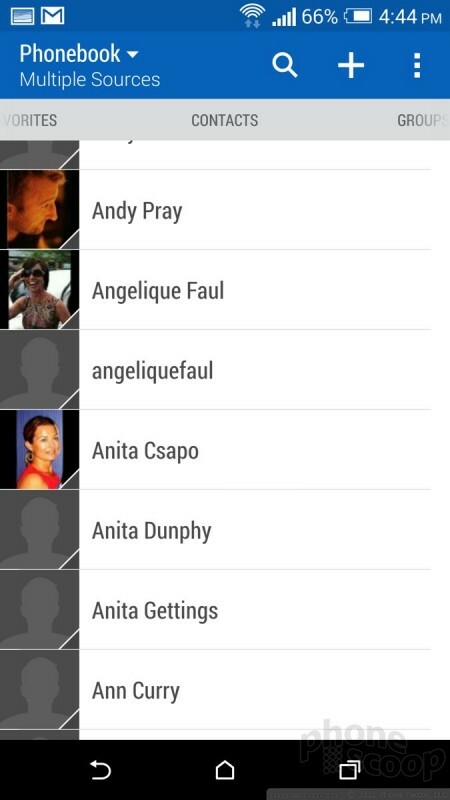 When scrolling through the full contact database, the app shows you the most recent social network status update from each contact, be it a Facebook post or Tweet. It does a great job of porting over profile images. It's a cinch to start a call or a message from the full contact list, but you can open each individual contact card to see all the person's information, as well as make edits. Together, the phone and contacts apps work well together and offer a lot of shortcuts between the two. Most of the messaging functions offered by the One are Google's services, such as Gmail, Google+, Hangouts, and so on. All the Google apps work without issue just like on every other Android device. 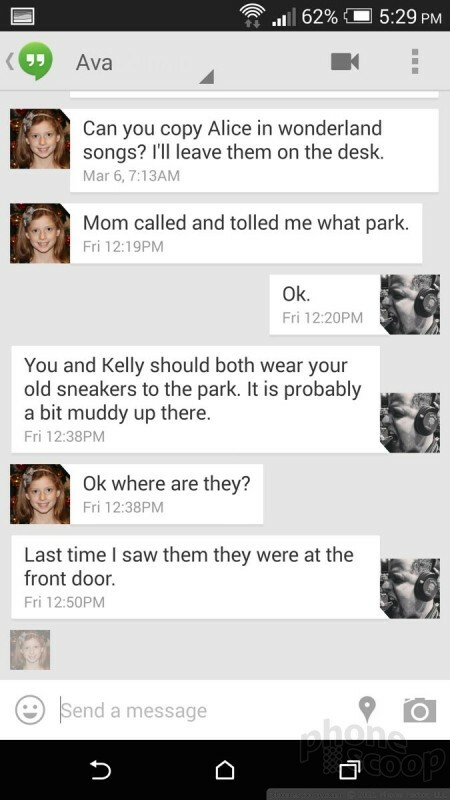 The new One's native SMS app appears to be carried over from the old One. The app places a blue bar to the left of each thread that contains unread messages. It's not intuitive at first, but you get used to it after a few days. 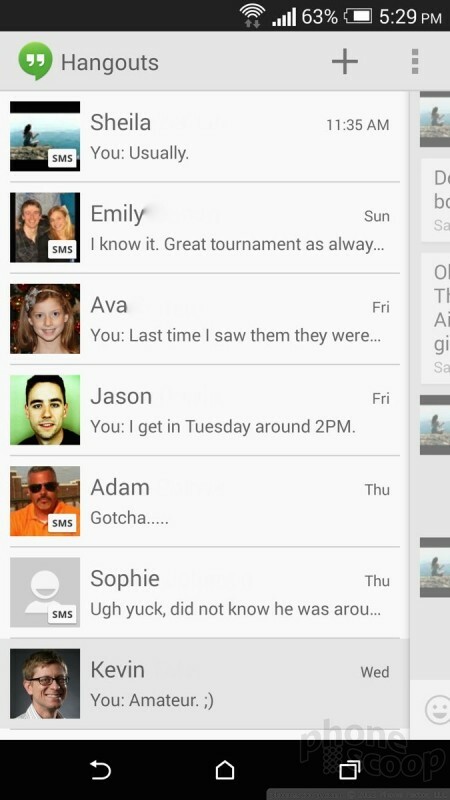 Your messages float on a gray background, while those with whom you're chatting are outlined in white. It makes it easier to see which side of the conversation you're looking at. 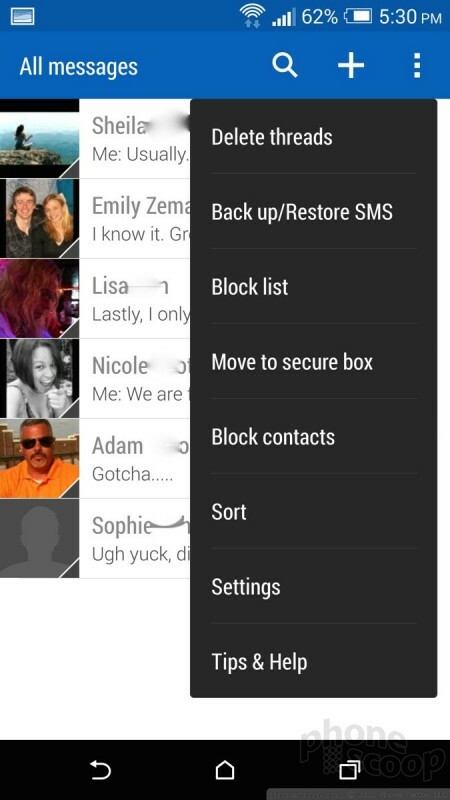 The app also has some powerful tools for saving and/or backing up conversations. Since Google now lets Android device owners pick which app they want to use for SMS, I've moved on to Google Hangouts and avoided HTC's SMS app. I still don't like the HTC keyboard. I find its swipe-style auto-correct isn't nearly as accurate as Google's standard Android keyboard. Further, it is way too easy to accidentally switch the keyboard to another language thanks to the placement of the language switching key on the keyboard itself. I wrote an entire sentence in French before I'd realized I'd changed the language. 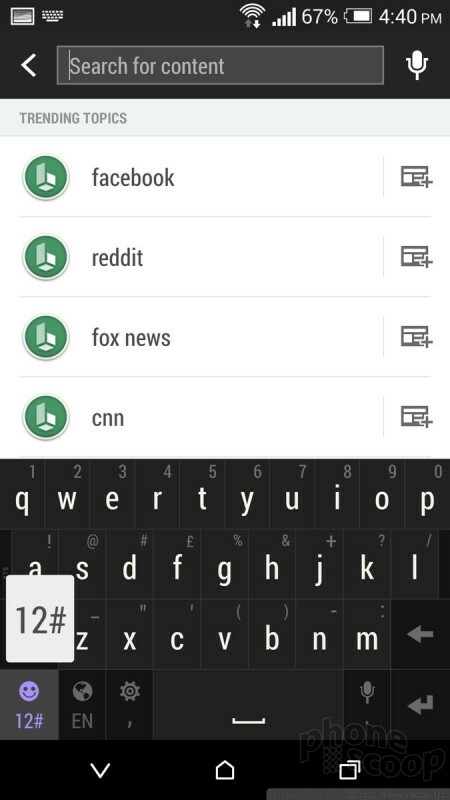 In the end, I substituted the native Android keyboard for HTC's. Since we're using an international, unlocked One, it's worth pointing out that carrier-branded versions may offer alternative messaging apps, such as catch-all services that bundle SMS, Facebook Messaging and Twitter DM.